America's first supersonic fighter (at least able to go supersonic in a straight line) was the F-100. North American at the time was one of the premier aircraft manufacturers, well known for innovative and sturdy aircraft that would get the job done with minimal fuss. Very much a child of its time, the F-100 was initially armed with four cannon, but later was outfitted to carry bombs and even later, both air to air and air to ground missiles. Such was the success of the type that it served with distinction in Vietnam until replaced by the F-105. It then soldiered on in the ANG until nearly 1980. In addition to the USAF, the F-100 was flown by France, Denmark, and Turkey in Europe. It was also heavily utilized by the RoCAF on Taiwan, most of these planes being F-100As updated with the later fin and other equipment. Several were lost flying intelligence missions over communist China. 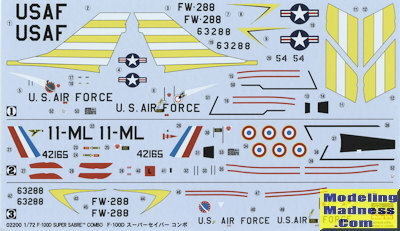 Back in the early 1970s, Hasegawa pretty well held the lead in terms of the USAF's Century Series fighter kits in 1/72 scale. True, today, these things are woefully inadequate in terms of detail and most modelers will shun this one. However, they are pretty inexpensive as things go, especially when ordering direct and do make into quite passable models for one's display shelves. Originally this was molded in an olive drab and today's boxing is in light grey. I was surprised at now nice the molds still are. Apparently Hasegawa takes very good care of their moldings. The cockpit is quite Spartan consisting of little more than a seat with radio bits behind it, a floor and a pilot to put into the seat. The instrument panel is molded in with the panel anti-glare panel and takes a decal for instruments. The instructions don't indicate any nose weight, but I'd add some just to be sure. Both the intake and exhaust pieces are somewhat shallow, but no worse than what you'd get on the ESCI kit. You only get the early exhaust so if modeling something from its later history where it had the F-102 burner can, you'll have to source that from somewhere else. The kit has a single piece canopy to cover your pretty empty cockpit. Wings have a full span lower wing with upper halves and separate fences on the outer wings. All of the pylon holes are already opened up. Wheel wells are equally Spartan as the cockpt with no real detail. Fortunately, the inner gear doors will cover up much of that. The speed brake can be positioned down if one wishes. There is also a separate tail bumper. Gear legs are fairly well done, though a bit light on detailing. The nose gear on many early kits had issues with alignment on the nose wheels, but it seems that that has been corrected. You get two different refueling probes, an early straight one and later curved version. Note that not all 'foreign' planes had this so if modeling one of the options, that will require the holes being filled. The kit comes with the long 335 gallon fuel tanks as well as the small 200 gallon versions. Note that the centerline has what is shown as a 'practice bomb'. I'd fill those holes and not use this bit. There are Bullpups for the inner pylon or one can attach dual Sidewinders. The Sidewinder pylon is wrong as it should be a Y shape, but the kit provides a T. The Sidewinders themselves are rather basic. Instructions have been upgraded to modern standards with Gunze paint references. There are three markings options with two units. The yellow striped tail is with the 493 TFS in 1959. A near identical scheme with the same serial is listed as 2004? Probably a museum plane. The other is with EC 2/11 with the French Air Force in the early 1960s before the type was camouflaged. Decals are very nicely done. If you don't like what's on the sheet, there are aftemarket. I am not sure how many folks will actually be interested in purchasing this kit. Hasegawa has very much made its money on this one and adding it to their Combo boxing series provides a pair of these kits for what is a good deal on a per-kit cost. 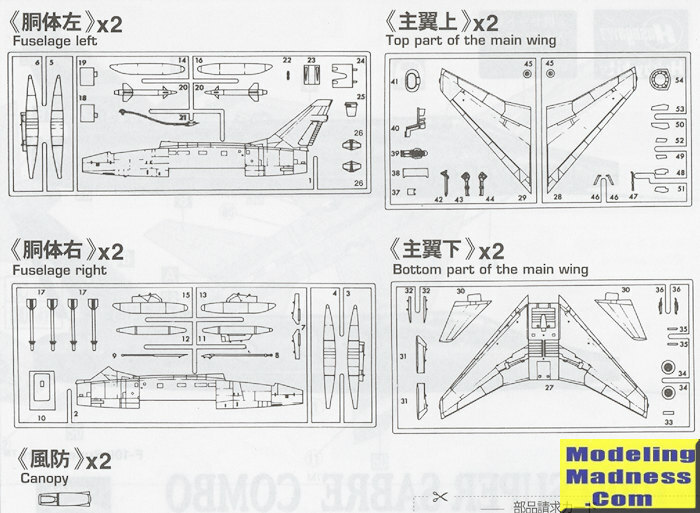 However, the kit is very much old school and those who are not used to these older Hasegawa kits may find the lack of detailing to be a minus. There are not a ton of parts and that should equate into a fairly quick build. Those who want a contest quality model will shun this one big time. Those who want a reasonably priced pair of kits and don't mind ordering from overseas, will end up with a pair of nice shelf models.